In an effort to support the integration process in Southeast Europe, the TRANSFUSE Association, the College of Europe and the European Fund for the Balkans are organising the 7th Leadership Development Programme for young people from Southeast Europe, as well as broader Europe, who aspire to play an active role in the future of their countries. 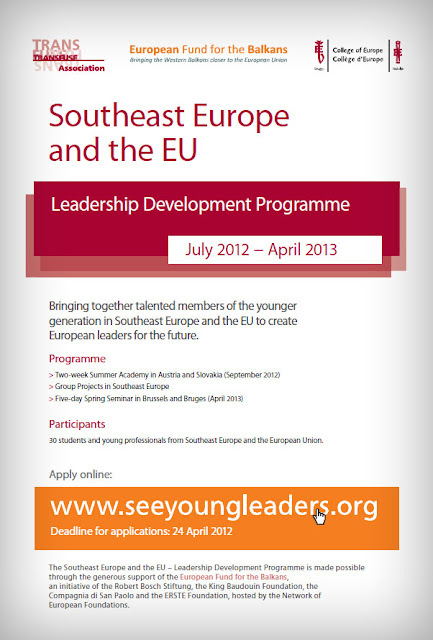 - A two-week Summer Academy in Austria and Slovakia, September 2012: the curriculum will include topics related to the European Union and the development of its relations with Southeast Europe as well as wider issues of international and economic relations and practical skills development through workshops and simulation games. - Group Projects in Southeast Europe, where the participants will work together in small multicultural groups to implement a joint activity in their countries. - A five-day Spring Seminar in Belgium (Brussels/Bruges) in April 2013 with visits to the EU institutions and NATO, and classes in the College of Europe. - The participants are expected to be available during the overall period of the Programme (from July 2012 to April 2013) and to attend each planned activity. - The cost of the participation in the Programme for the successful candidates will be covered by the Programme. This will include travel costs, full board and lodging, visa fees and health insurance where required. Up to 30 participants will be chosen to participate in the programme. They will come from Albania, Bosnia and Herzegovina, Bulgaria, Croatia, FYROM, Greece, Kosovo, Montenegro, Romania, Serbia and Turkey. In addition, a limited number of participants will be selected from other EU countries. The Programme is specifically designed for students who are currently pursuing or are about to begin their postgraduate studies as well as recent graduates at the start of their professional career. fully attend the three compulsory parts of the Programme.